Fine first edition in the delicate Gollancz jacket, with excellent provenance, a gift from Punshon to the Detection Club, (he became a member in 1933), in which Punshon has written on the front endpaper ‘The Detection Club’ with their address ‘12 Kingly St. W.1.’, it also contains the illustrated bookplate of the Detection Club library. Yet this same man was found dead with a detailed and accurate plan of Bobby Owen’s new London flat. Why? (Dean Street Press). The 25th Bobby Owen mystery. “What is distinction?... The few who achieve it step – plot or no plot – unquestioned into the first rank. We recognised it in Sherlock Holmes and in Trent’s Last Case, in The Mystery at the Villa Rose, in the Father Brown stories, and in the works of Mr. E. R. Punshon we salute it every time.” – Dorothy Sayers. 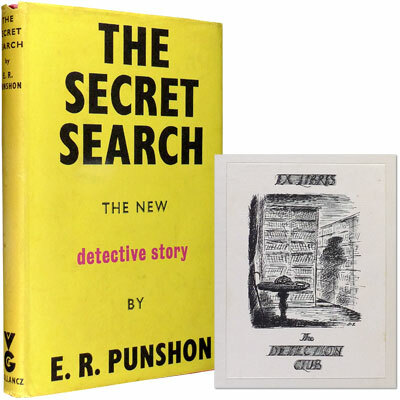 Superb copy in bright and unfaded Gollancz dust jacket, with fine provenance, containing the bookplate of The Detection Club, Punshon was initiated into the club in 1933. When the notorious gangster Cy King was imprisoned thanks to Commander Bobby Owen’s investigation, he spent a good deal of time talking about avenging himself... (Dean Street Press). The 28th Bobby Owen mystery. 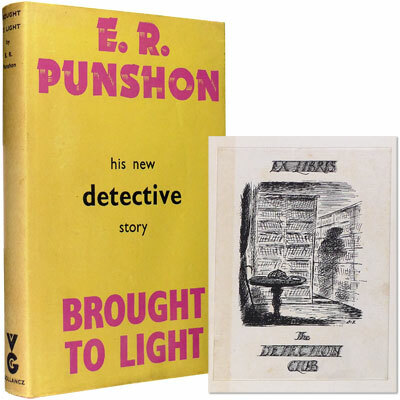 First edition, with fine provenance, containing the bookplate of The Detection Club, Punshon was initiated into the club in 1933. The stranger’s body was discovered by businesswoman Mrs Holcombe, the unofficial queen of Pending Dale. As if there wasn’t enough gossip rife in the village, now the Queen may be under suspicion of murder (Dean Street Press). The 30th Bobby Owen mystery. Whether [Rev. Thorne’s] disappearance was in connection with the contents of Janet Merton’s grave is something Bobby will come to find out, with the help of Edward Pyle, of the Morning Daily, Janet Merton’s formidable niece Christabel, John Hagen (church sexton and self-taught classical scholar) and a man named Item Sims (Dean Street Press). The 32nd Bobby Owen mystery. Inscribed ‘Pour M. E.Bayley amicalement’ by the translator, Stuart Gilbert, in year of publication. Featuring Inspector Maigret in ‘Death of a Harbour-Master’ and Superintendent Labbé in ‘The Man From Everywhere’. Contains two stories: The Mystery of the Polarlys, a swiftly moving story of crime, adventure and detection set on a thousand-ton coasting steamer plying between Hamburg and Kirkenes; and Tropic Moon, based in French Equatorial Africa. Contains Talatala, the scene of which is a coffee plantation in the Congo, and The Breton Sisters, based in a French fishing port. Contains The Lodger which opens with a daring crime on the Brussels-Paris night express, and One Way Out., an unforgettable picture of life in Paris on the danger-line in those chatic years immediately before the war. ‘After reading Escape in Vain I am prepared to travel either backward or forward in Simenon’s works.’ - Desmond MacCarthy, Sunday Times.